For some time now, I have felt that the time is right to write a book about Computer Chess. Ever since the first attempts at chess pro­ gramming were made, some twenty five years ago, interest in the subject ha"s grown from year to year. 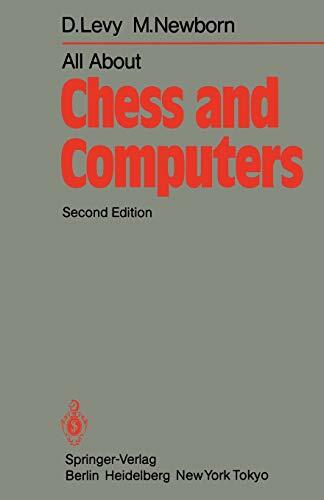 During the late 1950s the subject was first brought to the attention of the public by an article in Scient(fic American, and less than a decade later a chess program was competing in a tournament with humans. More recently, there have been tournaments in which the only participants were computer programs. and when the first World Computer Championship was held in Stockholm in 1974 the event was an outstanding success. Laymen often doubt the value of investing in a subject so esoteric as computer chess, but there is definitely considerable benefit to be gained from a study of the automisation of chess and other intellectual games. If it proves possible to play such games well by computer, then the techniques employed to analyse and assess future positions in these games will also be useful in other problems in long-range planning. I have tried to make this book both interesting and instructive. Those who understand anything at all about chess but who have no knowledge of computers, will be able to follow my description of how computers play chess. Those with a knowledge of both areas will still find much to interest them. Levy, D. / Newborn, M.